aQuest is built on top of the Enkronos Apps stack and uses smart contracts to regulate signes for ERC20 quests. Everyone can join aQuest, no restrictions, no KYC. Our Mobile first approach enables you to earn easily on your mobile device. aQuests are a great way to help build up the Users Pool in Enkronos Apps. aQuest can be a survey, a Bounty task, a Facebook like, watching an add, installing an app or catching a Pokemon on Pokemon GO. You can pay your signees in ERC-20 tokens. In future we plan to implement also PayPal, Credit Cards and other digital currencies. 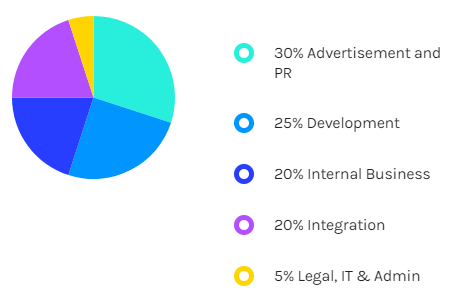 The initial issue of AQU tokens is programmed by a smart contract and will be carried out as you can see on the pie chart. For a good governance of the aQuest app, transparency is a key value. The overall allocation percentages are the same as stated in the Whitepaper and also displayed in pie chart on your right. The origin of aQuest platform idea. Development of the concept and business plan. Elaboration of aQuest platform legal model in various jurisdictions. Development starts. Preparation for ICO. Development of a smart contract for AQU token release. Private sale starts. Continue the development of the platform. Private sale ends. Pre ICO starts. aQuest API development. aQuest web application development. Start of the marketing campaign to attract end-users. March 2019 – Release of platform’s beta version. Start of AQU wallet.